Skimmia japonica 'Kew White' is an upright, but rounded evergreen shrub with oval, glossy, dark green leaves and dense panicles of fragrant white flowers in spring. 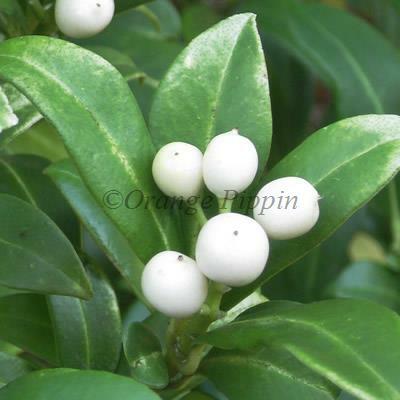 These may be followed by large clusters of round, white berries if planted near a male variety of Skimmia for pollination. This easy to grow, low maintenance shrub is a fine plant for autumn and winter interest and would be best grown in a full or partially shaded position in the garden, a woodland area would be the perfect spot.